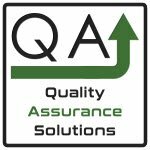 Please Become a Reseller with Quality Assurance Solutions! We are looking for resellers to help promote and resell our products. Are you a consultant, trainer, educator or webmaster within the QA, QMS or Process Improvement world? Do you see a need for your clients to use our products? Do you want additional revenue during your business activities? We offer a wide breadth of products that support your customer needs. This includes software, on-line training with accredited certifications, videos, manuals, training guides, and exclusive kits. If you want more details, please fill in the below form.